A casa oferece uma casa confortável para até 4 pessoas em qualquer época do ano e dá-lhe uma base maravilhosamente conveniente para explorar a Provence e além. O Villa Nova é um empreendimento exclusivo de 15 moradias modernas e a Villa 'Belle Epoque' original situa-se no seu próprio terreno e apenas a 5 minutos a pé do centro de St Remy de Provence. Ele oferece um ambiente tranquilo e seguro como base para as suas férias em Provence. Os hóspedes têm um espaço de estacionamento seguro e reservado dentro do recinto e o acesso é feito por portões eletrônicos ou chaves. Você será recebido por um residente de língua inglesa, da cidade, que terá preparado a casa para você e estar à disposição para ajudar com qualquer coisa que você precisa durante a sua estadia. Um quarto olha para fora através do Alpilles e oferece-lhe a escolha de uma cama king size ou duas camas de solteiro. Há uma quantidade generosa de espaço de armazenamento e um ventilador de teto para as noites mais quentes. Quarto dois enfrenta o pátio e tem vista para o original Villa Nova. Novamente, há uma escolha de uma cama king size ou 2 singles. Amplo espaço de armazenamento é fornecido e novamente um ventilador de teto. O banheiro, com chuveiro grande, também é no primeiro andar. A cozinha, com superfícies de trabalho de granito, está totalmente equipada e está bem equipada para dar o necessário durante a sua estadia aqui. O salão é decorado com o seu conforto em mente. Há um grande sofá para relaxar, enquanto refletindo sobre os seus dias em Provence. Curta seu CD ou DVD favorito ou talvez acompanhe seu programa favorito (em inglês ou francês). O terraço que leva do salão é um ótimo espaço para aproveitar o sol. É completamente privado e um toldo retrátil oferece sombra de boas-vindas. A casa fica a 5 minutos a pé do coração de St Remy de Provence - uma cidade mergulhada na história dos romanos até Van Gogh. Com mais de 60 cafés, bistrôs e restaurantes, você realmente será mimado pela escolha. Para os clientes entre você St Remy possui um grande número de lojas individuais. Há o mercado em um mercado de quarta-feira que serpenteia pelas ruas e praças oferecendo-lhe todos os produtos da Provença. St Remy está idealmente situado para explorar a paisagem rural. Avignon com o seu Palais des Papes (UNESCO) fica a apenas 25 minutos de distância. As cidades romanas de Montpellier, Nimes, Arles e Orange estão todas dentro de uma hora de carro como é a costa e o Carmarge (Regional Parc Naturel). Há o Luberon com suas vistas espetaculares e belas aldeias, a Pont du Gard (outro local da UNESCO), Isle-sur-la-Sorgue, Aix-en-Provence, Fontaine-de-Vauclause e Les Baux des Provence. Com todos estes e muitos mais você pode ver porque as pessoas continuam voltando! Não há custos ocultos ou encargos - todos os custos de linho e limpeza estão incluídos. Confiável, falando Inglês, serviço de babysitting disponível. Desculpe não animais de estimação ou permitido fumar. Julie was our host, and she was great! We got good tips and suggestions from her, and prompt responses to our queries. The property was charming, and was as described. Everything was spotless, and the appliances were easy to use. Julie leaves detailed instructions on how to work everything. The beds were comfortable, and there was a decent sized shower. The kitchen is well stocked with utensils, dishes, etc. Although it rained, the patio was private and cute. We did manage to have an impromptu picnic out there one day. The town itself is delightful! Had some great meals, and the market on Wednesday was great for shopping. All in all, we loved it! Fabulous property in St Remy! What a way to end our trip! This house was great! Our trip ended in Provence and couldn't have picked a better place. This house was amazingly furnished and comfortable! The property manager, Julie, was Great! She was always available if there was anything we needed! This house also has private parking which is a huge bonus. The patio is a great place to relax at the end of a day. I highly recommend this house and would definitely stay there again! It is a great location for exploring this part of Provence! My husband and I spent 9 nights in St Remy at this delightful townhouse. I can heartily endorse the comments of the 2 previous reviewers. The apartment was spacious, modern and spotless, very well equipped with high quality appliances and furnishings, and the availability of a private car park in a secure gated community was fantastic. The grounds were simply beautiful with lavender just beginning to flower and we thoroughly enjoyed returning each day from our travels to this comfortable and refreshing environment. Julie, the manager was very helpful and available to answer our queries, and the information provided in her booklet was great. St Remy itself is a lovely town and the apartment was a very good base for day trips to surrounding areas; the walk into town only a few short minutes. Our stay here was extremely enjoyable and I would not hesitate to recommend it - we would be very happy to return! Villa Nova was the right choice for us on our visit to Provence. Set in the courtyard of an old villa, the townhouse has everything we needed to make our stay an absolute delight. We used the terrace for wine , cheese and olives at the end of each day and enjoyed the comfort of the living area when temperatures got cooler in the evening. There were 3 of us traveling and the two bedrooms and 1.5 baths were perfect. The kitchen has everything you need to prepare meals which, given the the abundance of food shops and locally sourced meats and vegetables in St Remy, we did with some regularity. The townhouse was immaculate and Julie, the property manager, was always available for questions. The standard one is usually how to program settings for the washing machine but the instructions Julie left were good enough for even us to understand. Having available, off street parking was also a nice plus. 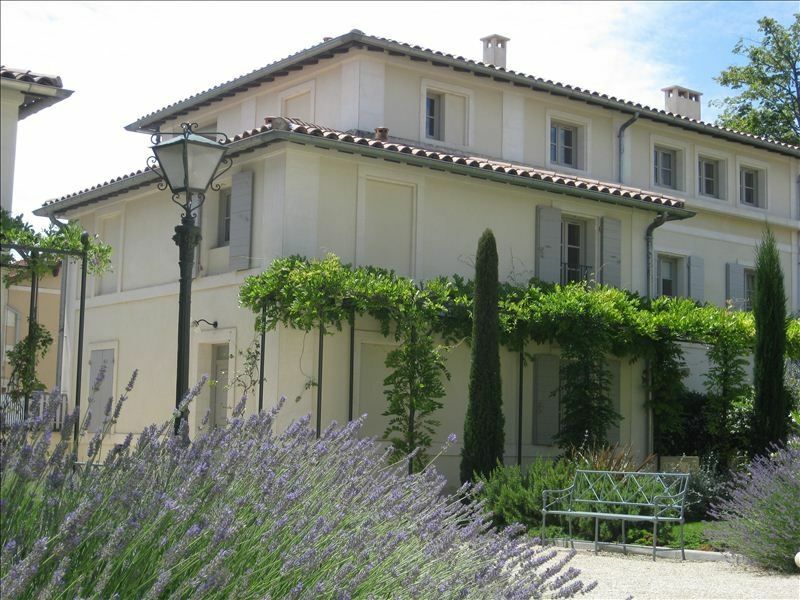 Villa Nova is just a very short 5 minute walk to the Place Republic and the center of St Remy. We would head into town at the end of the day either for dinner or just a cafe on the street for people-watching. For days that you might not feel like driving, St Remy is a great town with museums, a wonderful weekly street market, Roman ruins and very good restaurants. Van Gogh spent time at a local hospital and you can feel his presence when you look at the Alpilles, olive trees, and fields that ring the town. The town is full of charm and Villa Nova only improves the overall experience. Villa Nova is a real gem. If you plan on staying in St Rémy, this is the place for you. The villa is located about 7 minutes from the city center. It is in a quaint gated community with ambiance plus plus plus. ; as soon as you enter the area, you get the “oh yes “ feeling. Then when you go in the villa, you get the “wow” factor. The villa has everything you need for a “home away from home” place. This two storey villa has two lovely bedrooms and one full bathroom on the upper level. The main level offers a roomy living / dining area, a super well equipped kitchen and a powder room. There is also a patio where you can enjoy a meal or read a book. The place is clean, modern and has all the luxuries one needs for a perfect holiday. ( expresso coffee machine, wifi, television, c.d. player, land line telephone, washer/ dryer, dishwasher, etc.) My sisters and I spent 6 nights at Villa Nova. I could have easily have settled there for a month. Julie is the perfect property manager. She has a booklet with all the info you need for the villa. She was also very helpful in giving us very useful suggestions for the area. All transactions with Julie were pleasant, professional and smooth. If Provence is your destination, consider St Rémy as a hub. You can easily walk everywhere in the town. Do not miss the Wednesday morning market, the Vincent Van Gogh walk, the St Paul de Mausole to name a few. Julie has a good collection of books and maps you can consult for the area. We were able to do many day trips comfortably knowing that we were coming home to our little gem at Villa Nova. Our stay at Villa Nova and St Rémy was so special. I would go back there in a heartbeat. Fantastic Location & Great House! This was a lovely house with plenty of room for the 4 of us, as we were two couples. We settled in quickly to the townhouse which is set in a secured quaint courtyard of an old villa. The view from both bedroom windows were just beautiful, one overlooking the courtyard and the other had a rushing stream out the back. The was a nice comfortable sitting area on the main floor, a lovely patio with a table, a large kitchen fully equipped, two lovely bedrooms, a full bathroom with shower and a large extra two piece bathroom. Everything was clean, modern and up to date, with a French charm to it. Julie the property manager was wonderful to deal with and was responsive with any questions. St. Remy was a really nice village with great restaurants, shops, patisseries and gelato! We were just a 2 minute walk to the center of the village and we really enjoyed our time in this charming town and villa. We lucked out and we were there on the Patron St. Day when the running of the sheep took place! We loved the patisserie that was just down the street from the villa and enjoyed fresh pastries from there each morning.